Description: This political poster measures 1’ 10 1/16″ and 1′ 2 1/8″ wide. Object History: Vivian Loretta Seigler Wright (1932- ) was born in Wilmington, NC. She attended New Hanover High School and was awarded the Amy Bradley Medal for scholastic achievements. She worked for the Tide Water Power Company and then for the Carolina Power & Light Company. 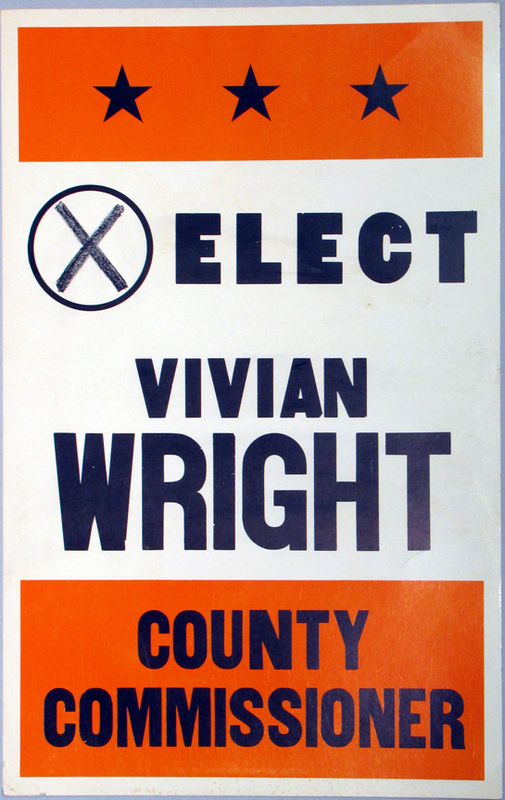 Wright served as the Republican representative on the New Hanover County Board of Elections in 1971, and was later elected as the first woman to serve on the Board of County Commissioners. Wright was elected to the Board of County Commissioners in 1972. She ran as a conservative Republican and was the first woman to serve. She was re-elected in 1976, and in 1980 made an unsuccessful run for a seat in Congress. General History: In August of 1920, the 19th amendment passed, granting women the right to vote. But it wasn’t until 40 years later that New Hanover County’s voters elected a woman to office. Hannah Block became the first woman to serve on the Wilmington City Council from 1961-1963. The late 1960s was a period of change, as more women ran for office. One of those women, Augusta Mosley Cooper, narrowly lost her bid to become the first African American woman to serve on the city council. Since the time Vivian Wright was elected, a handful of women have been elected to the board of commissioners, including Karen Gottovi, Julia Boseman, Nancy Pritchett, and Beth Dawson.